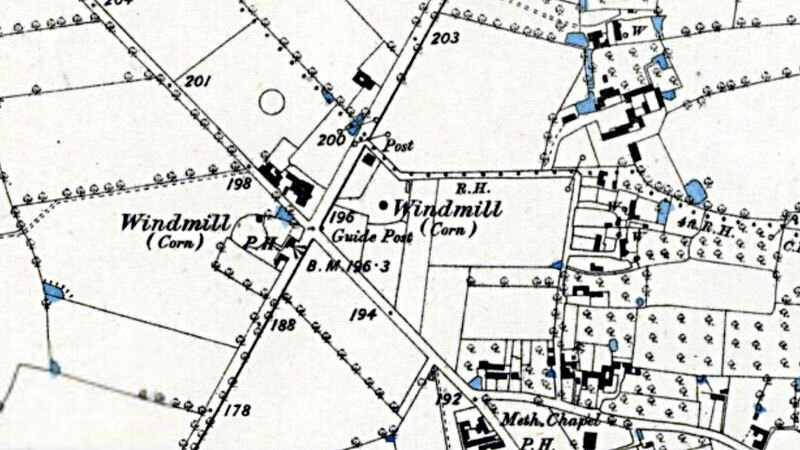 Forncett End had two postmills within a few hundred yards of each other. One was an open trestle white mill and the other a black_mill that stood just to the northeast of the crossroads. The white mill had a leanto porch that was the whole width of the mill and the mill was turned into the wind with a tailpole. One pair of patent sails and one pair of common sails turning anticlockwise, drove two pairs of 4ft 6ins French burr stones and a flour mill and a dressing machine. 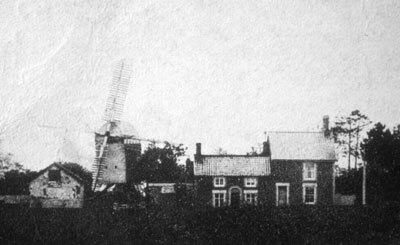 A Capital POST WINDMILL with two pair of French Stones & a Flour Mill within her, situated at Forncett St. Peter in Norfolk, with or without a Dwelling house, Granary & other convenient Buildings & one acre of exceeding good Land, with an advantageous right of Commonage. Enquire of Mr. John Limmer, Tibenham. John King of Forncett St Peter made a will on 5th July 1802 and it was proved on 18th November 1802. John King's wife Frances and their son James King were appointed as executors. Everything was left to Frances - ... personal estate whatsoever, and any monies to arise from the sale of my said land and windmill, if not sold by wife before her death. John King's money was to be divided up in fourths. ¼ to William Long, of Bunwell, farmer, upon trust to place at interest the said ¼ to be applied to the maintenance & support of John King's daughter Sarah, wife of James Stebbings. ¼ to daughter Frances, wife of James Moor. ¼ to grandson John King at 21 etc………. The King family remained in Forncett working as millwrights. 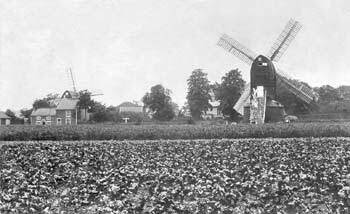 All that capital POST WIND-MILL in full trade together with two pairs of French stones, flour mill and dressing machine, together with a new built dwelling house and half an acre of land, situate in Forncett St. Peter, in the county of Norfolk, all of which is freehold. May be entered upon at Michaelmas next or sooner if required. Apply to Mr. Henry Knights on the premises. When William Lent died intestate in March 1842, his son George Lent swears on a bond that his father is his lawful father and a widower. In 1843, administration is then given to George Lent, miller of Forncett St. Peter, together with Joseph Lent & Timothy Lent, respectively, milllers of Tibbenham. George and Joseph signed the administration and Timothy made his mark. To be Sold by Auction by Mr. John Standley on Monday 25 July 1853 at 4 o'c at the Kings Head Inn, Bunwell. By order of the Trustees for sale thereof under the Will of Mr. Henry Knights deceased. Lot 1. A Messuage & Baking Office, barn, stables, granary, cart lodge & other convenient outbuildings, yard & garden. Also a good Post Windmill with 2 pairs of excellent French Stones in Forncett St. Peter. Mr. Knights carried on an extensive business upon this property for many years. Late in the occupation of Mr. Henry Knights & possession may be had at Old Michaelmas next. Apply to Messrs. Mitchell & Clarke, Solrs. or the Auctioneer, Wymondham. A Piece of artable land containing 1a. 0r. 20p. near the Turnpike Rd. The above Property was for many years in the occupation of the late proprietor, Mr. Henry Knights, decd. Apply to Mitchell & Clarke, Solrs. Wymondham. Frederick Fox (34) timber carrier, was charged with stealing half a bushel of beans, a peck of barley and a sack, the property of Mr John Knights, at Forncett St Peter and Robert Gray (28) labourer was charged with receiving them, knowing them to be stolen. John Knights..miller at Forncett St Peter. On the 5th of July he went to a place where a sack was concealed..in a hedge..contained barley and oats. Watched that night with a person called Mann...next night they watched again and at about half past eleven o'clock at night they heard a rustling and on looking saw the prisoners coming towards the gate some 20 or 30 yards from where the sack was secreted. Gray had the sack on his shoulder. Tapped Gray on the shoulder and asked where he had got it. He said he did not know. Fox said “you had better lay it down Robert” The sack belonged to one of the prosecutors employers. The beans were such as he had been grinding...defence set up that the articles ere taken for Mr Knights pony. Fox was Knight's servant. Gray was acquitted...Fox guilty..six weeks imprisonment. To be sold by Auction by Mr. John Standley on Monday 24 July 1856 at 4 o’c at Queen’s Head Inn, Bunwell. By order of the Trustee for Sale thereof under the Will of Henry Knights decd. Lot 1. A Messuage & Baking Office, barn, stable, granary, cart-lodge & other convenient outbuildings, yard & gardens:Also a good POST WINDMILL with two pairs of excellent French stones 4 ft. 6 ins. diameter. The above property is Freehold & situate in Forncett St. Peter adjoining the road leading from New Buckenham to Norwich & upon which Mr. Knights carried on an extensive business for many years. The whole of the above property is now in the occupation of .. Knights & possession thereof may be had at Old Michaelmas next. Apply to Mitchell & Clarke, Solrs. or the Auctioneer, Wymondham. 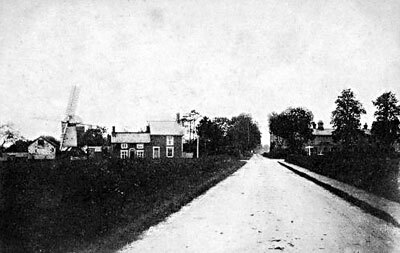 In 1867, Miles Blomfield sold the mill and land at Forncett St Peter to James Spratt with the transaction being handled by Standley & Co., Solicitors of Norwich & Wymondham. The Knights family aslo aowned and ran the Jolly Farmers pub nearby. John Knights, miller and publican made a will in 1867. 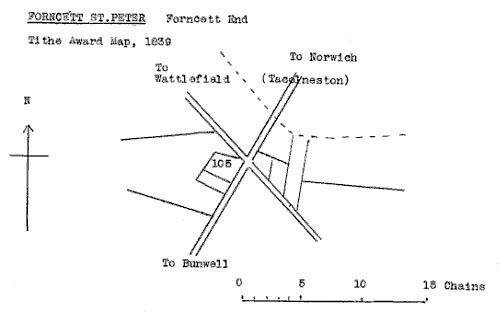 At Forncett End, Norwich, till after the Great War, there was an open trestle post-mill – that is, a post-mill without a round-house – but a gale in 1919 left it a sorry remnant, and it has since been cleared away. In the Forncett End Mill … the main bearers rested on four brick piers about five feet high. A scale model of the Norfolk mill can be seen at the Bridewell Museum at Norwich. The mill finally collapsed and fell over at 3.00a.m. on Sunday 25th November 1917, after one end of a crosstree gave way and it was not noticed in time to save the mill.